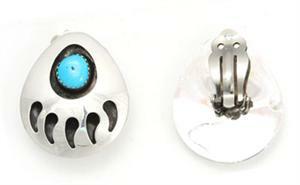 Navajo crafted sterling silver large bear-paw earring with freeform turquoise stone. Measures 1 1/4" long by 1 1/8" wide. Made by Cynthia John. Turquoise stone will vary in shape and size.